Hmmm, yet another post about how writing is like bread baking? Can there be too many? This post is less about the practice of forming or cooking the loaf, and more about your ‘starter’, that thing that bubbles away and gets things to rise. This is a post with a lot of references to other people’s stuff–all of their thinking and writing is added into my writing starter too! Thank you! Experienced academics don’t start every piece of work fresh–they repurpose, develop or build on existing work. I recommend the beginning Wendy Laura Belcher’s Writing your Article in 12 Weeks, where she talks about starting with an existing piece of writing to develop into your article. Now, starting out on your research journey as a brand new researcher, you were probably starting from almost nothing. Maybe you have some basic ingredients, tools and techniques down from your undergraduate work, but probably you (like me) had to go out and search out speciality flour, special equipment, read a lot of books to just get a sense of how to make bread and what the different methods were and why you would use one rather than another. Maybe you were used to writing 8-20 research essays a year, on a great swathe of novel topics. You hadn’t yet started to specialise particularly. With many kinds of amateur baking (like most birthday cakes), you do want to start from scratch, and you need to use fresh ingredients like milk, eggs and butter that don’t last well. You probably can’t recycle the amazing train cake for your toddler’s next birthday, and might need to work out how to make a swimming pool cake, or a transformer or whatever. However, most academic writing is not much like birthday cakes, or even like cream puffs. Academic writing is designed to be more like making loaves of bread for a living. You want to be consistently producing a useful product of the same quality, regularly, that other people want to pay for. And if you are making sourdough, you don’t get the flavour and rise from specialty ingredients or fresh yeast, but from a starter or ferment. A starter or a sponge is not the finished loaf, it’s just what gets it going. Sourdough starters are a bit like inspiration. You get it going by adding water and flour to a bowl and putting it out in the sun and hoping the yeasts will ‘catch’. Or someone else gives you a bubbling tub of goo that’s already going. Or maybe you took a course or ordered some dried starter online that you then developed for yourself. So there are lots of ways to catch it, and get things moving. Robert Boice’s invaluable Professors as Writers sparked this bit of the post. If you are baking every day, you keep your starter out on the workbench. You’d use it every day and feed it every day. This kind of starter is very active, it’s clearly bubbling along, growing and developing and you can easily see how it will react in your bread, helping it rise and giving it a tangy sourness as well as a subtle range of deep flavours. If, like me, you are baking less regularly than that, you should feed your starter and then put it away in the fridge, to slow it down. The starter then needs rather more work to get it going again, a sponge (which is where you make a bigger ferment from your starter the night before), some time in the warmth, sometimes an emergency rescue. These starters are less active, less bubbly, they tend to have a milder flavour. However, they get your bread going, about once every week or so. If you are baking less frequently than that, you still need to feed your starter regularly. You need to bulk it up and feed it a larger amount of flour and water, and still feed it every two weeks. You’re probably going to want to put it in the freezer if you’re going away for over a month. And if you have done this, you will need to give your starter quite a bit of TLC, some more regular feeding and warmth, to get it back up to full power. I forgot to feed the starter last week, but it survived to make a lovely loaf, with some care. If you have a daily writing habit, your academic work is always bubbling away on the desk somewhere. It’s easy to sit down and churn out another loaf. The conference paper can become a grant proposal, which then adds back to the ferment and help rise the article, which goes on to help develop the book. 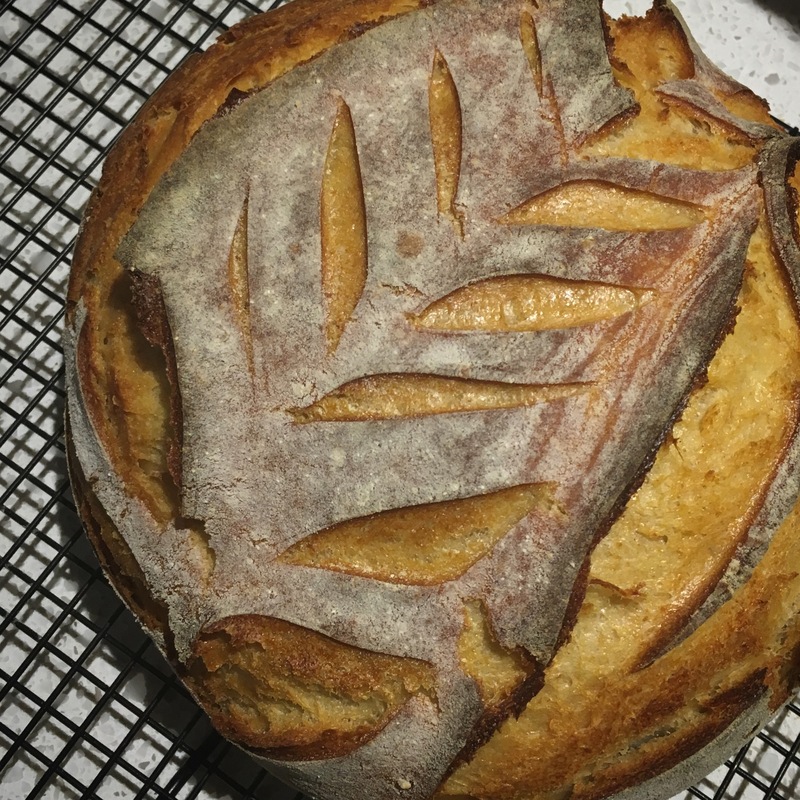 Each day you write, each thing you add into the mix, the contexts you work in, the more unique to you your ferment becomes, and the more consistently you’ll be able to produce a well risen loaf that other people want to eat. Erin Marie Furtak wrote on My Writing Productivity Pipeline: Write a lot, and often, we are told — but no one shows us how to keep track of all that work; and Pat Thompson has written on how blogging keeps her writing ferment going using exactly this sourdough starter metaphor! If you have three writing days together in a fortnight, rather than a daily writing practice, that can work too. You will need to spend more time at the beginning waking up your writing ferment, but once it’s awake again, you should have great bread. You’ll need to be careful about feeding it and storing it well between writing bouts too, so you have enough bulk to get you through a major bake-off. On building a regular writing practice, see Jo van Every’s work, including A Meeting with your Writing. If you need a physical meeting with your writing, I recommend a Shut Up and Write group, which I discuss in my posts on generative writing. If academic writing is basically just a hobby–a passion you are pursuing part-time around your real work— you need to think about how you’ll get going each time you return to your desk. What techniques and strategies can you put in place to make sure you don’t always have to start with two weeks of coaxing a new starter to life, but can instead get it going more easily? I haven’t found a lot of great resources for people pursuing research higher degrees part-time for passion around demanding jobs or family commitments, but I do meet people who are in this boat. If you know any good resources, link them in the comments! How is it, every time I sit down to write about bread, I produce 1000 words without much trouble? It’s because I’m procrastinating… or rather I’m practicing avoidance productivity. Now it’s back to the timetable. Previous But what if I don’t wanna? I just set off the fire alarms trying to reseason a pan recently, so I think that bit needs work. The Food Lab says you can wash cast iron with soap, hot water and a soft cloth!